Welcome and thank you for your interest in owning a J.R. Crickets® restaurant. We at J.R. Crickets® Enterprises Inc. take pride in offering the most economical and personally gratifying business opportunity available to you today. Please take your time and enjoy envisioning your success and happiness as a J.R. Crickets® restaurant owner. Once you apply online we will provide you with the necessary information required to start your business. We understand that for many of you, this is a life decision and investment. 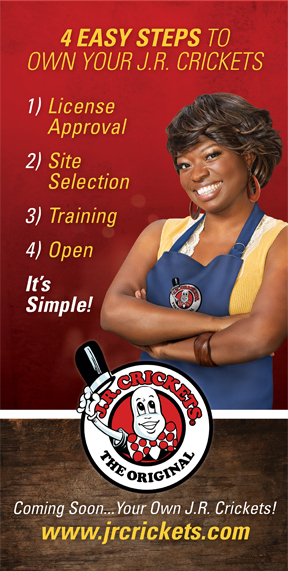 We will take our time and work with you to make your owning a J.R. Crickets® restaurant a dream come true. It is our goal to use our expertise to make your business successful. In summary, when you succeed, we all succeed and grow. Thank you again for your inquiry. A link to our Ownership Application Form is below.